Changing lives through Jesus Christ to make a difference. This is an active tense mission statement. What are we about? What are we about, here at Westminster UMC? We are about “Changing lives.” Our lives as well as the lives of those we have the opportunity to come in touch with through the mission and ministries of Westminster UMC. We thought about specifying “Make a difference in our world” but we also thought that leaving it open ended allows for more ways to make a difference. ​God’s vision is often given to a group of people for a season of their church life. As God’s vision is realized then new visions will be raised up, so the vision drives our ministry. Resources, financial and personnel, will be focused toward the realization of the vision. There will be no lonely people in our congregation. Hospitality and welcoming ministries will be implemented. Fun Fellowship team was created to bring our members together for no other reason than to enjoy each other’s company. It is through these events that we come closer together and build our relationship and fellowship. 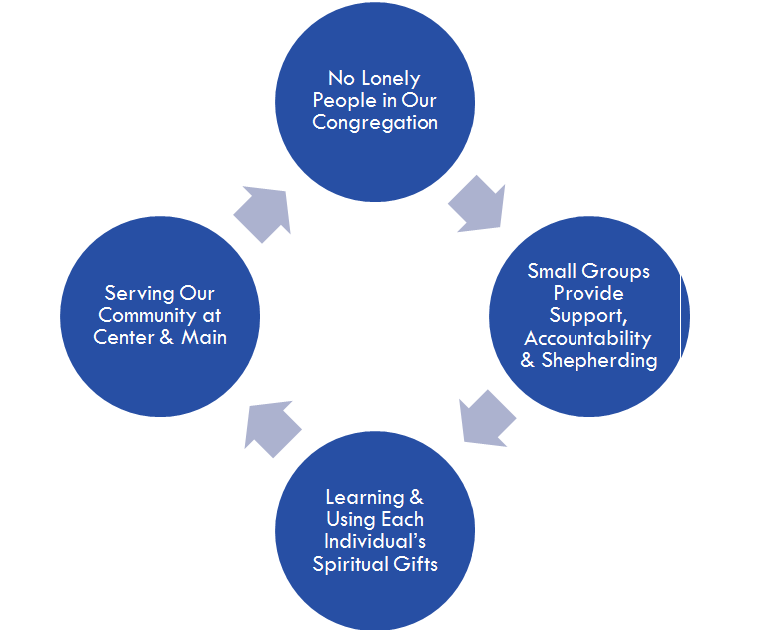 We have already begun a good foundation of care-giving ministries at Westminster. We will grow small group ministries so that our congregation can actively engage in Bible study, devotion, and service as a participant in a small group. We believe it is through small groups that members and those affiliated with us have an opportunity to grow deeper in their spiritual relationship with God and with others. It has been said that as a community of faith grows larger it must also grow smaller. What is meant by this is that as our congregation grows larger our membership needs to affiliate themselves in small groups for bible study, devotion, and service. As the church at Center & Main, we proclaim God’s love by serving all in our neighborhood and beyond. In several of Paul’s letters he affirms that each of us are entrusted with gifts from the Holy Spirit for the building up of the body of Christ. It is vital for our members to discern God’s spiritual gifts so that we can find meaningful places of Christian service in the kingdom of God. ​Core Values are those stated and unstated concepts or standards that we currently, or hope to, embody through the collective ministries of our congregation.